June 22, 2018--Done! 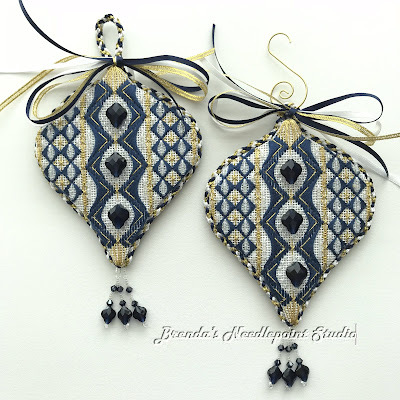 Here are the two finished Sapphires and Sparkle ornament--one for me to keep and the other to give away. Love how they turned out. PS Can you see something different about them? June 21, 2018--All the beads, except for the bottom tassel, are done. Boy, does this ornament shine!!! I took a side view picture of the ornament, but the crystal beads and bicones aren't showing up well. Will try again after the Kumihimo braid has been added around the edge. 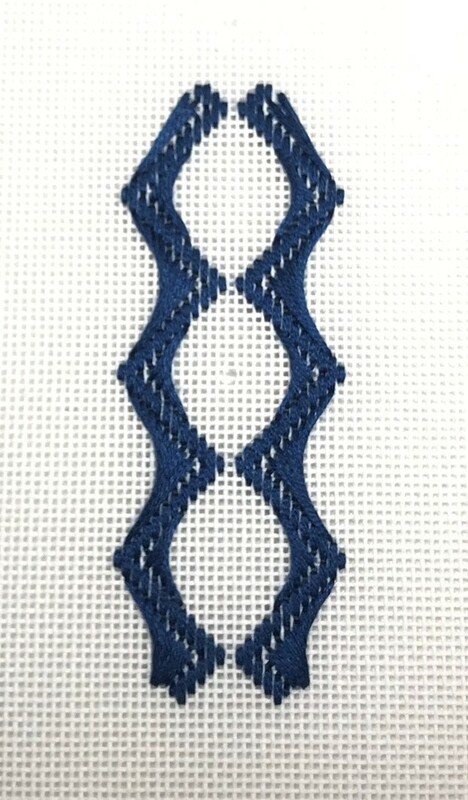 Speaking of braiding--I love how this one is turning out. It's different than the 8 strand braids which form a spiral. When using only 6 strands of 1/8" ribbon, as I am here to keep the bulk down, the look is more checkered (or something like that). However, it looks great against the ornament. Next step--putting it all together. 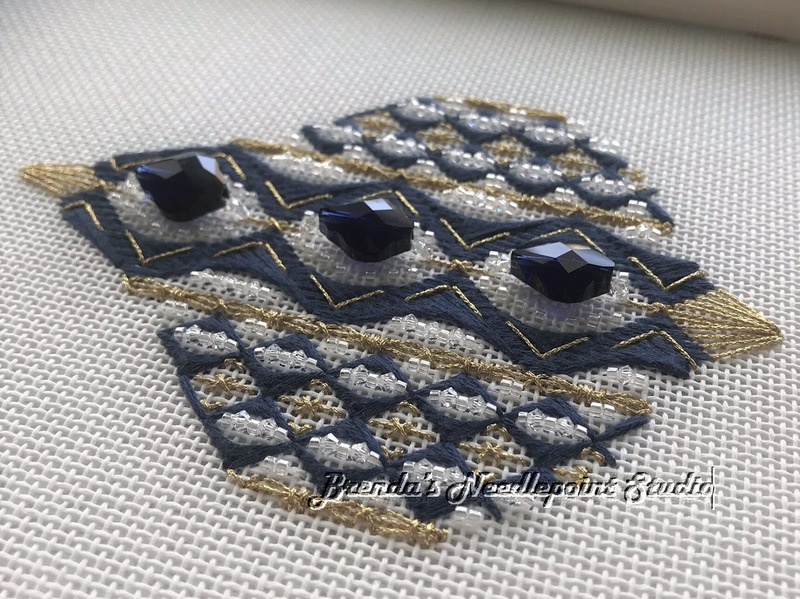 June 15, 2018--The stitching for the ornament is now done and I'm ready to start beading. As I've done in the past, I'm doing two of these ornaments--one for my needlepoint chapter ornament exchange and one to keep. Both are done up to this point. 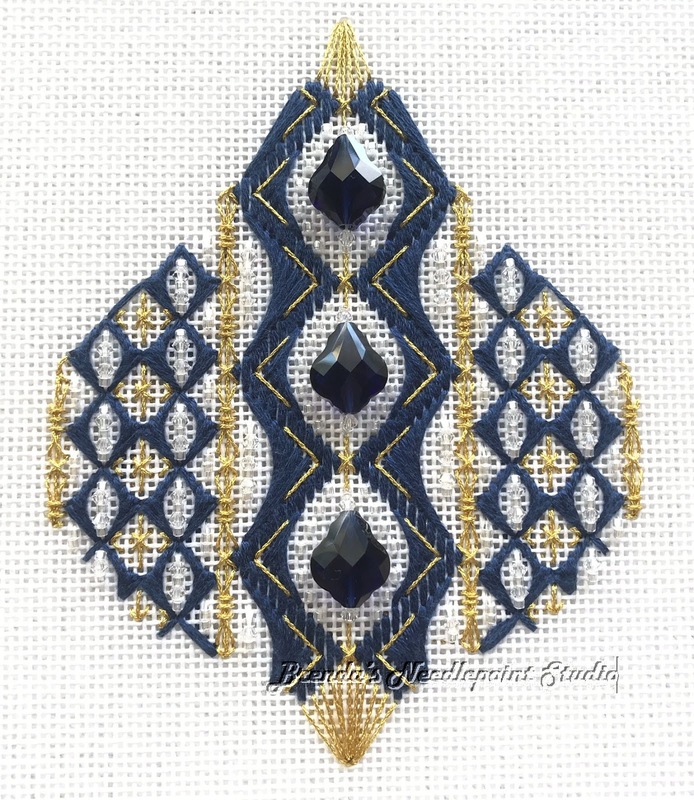 Now to find my beading needle. 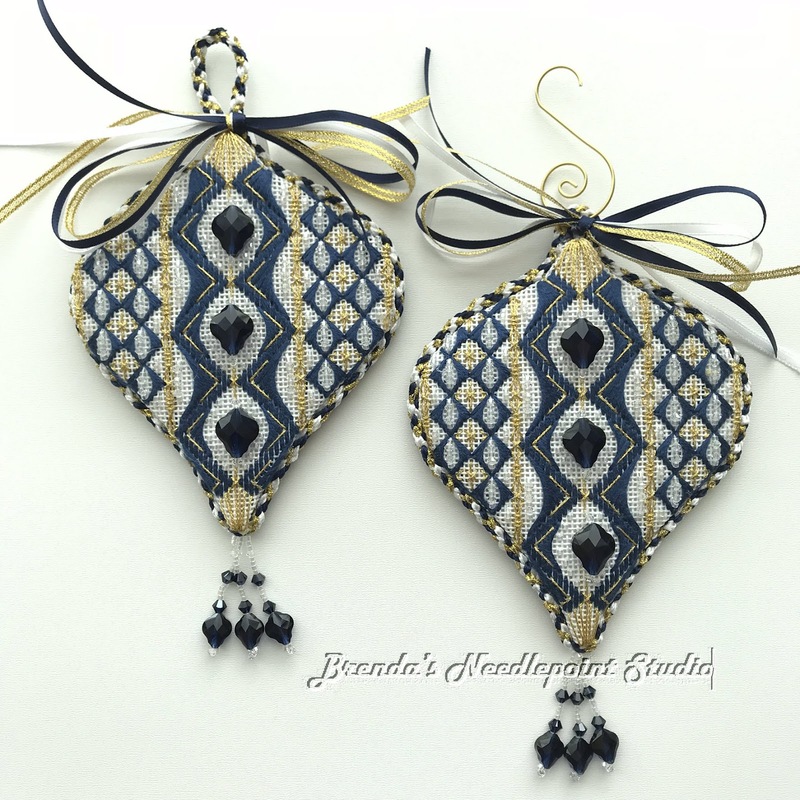 June 10, 2018--Pat Mazu designed a beautiful ornament called Sapphires and Sparkles to commemorate ANG's 45th anniversary. 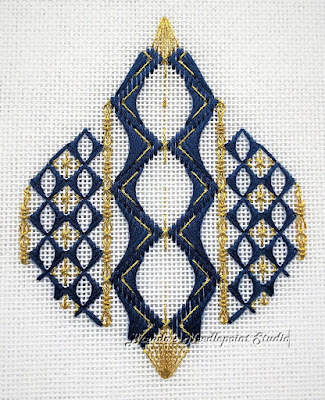 The instructions to work up this ornament were printed in the November, 2017 NeedlePointers Magazine and I knew I just had to stitch it for my ANG chapter's holiday ornament exchange in December of this year. 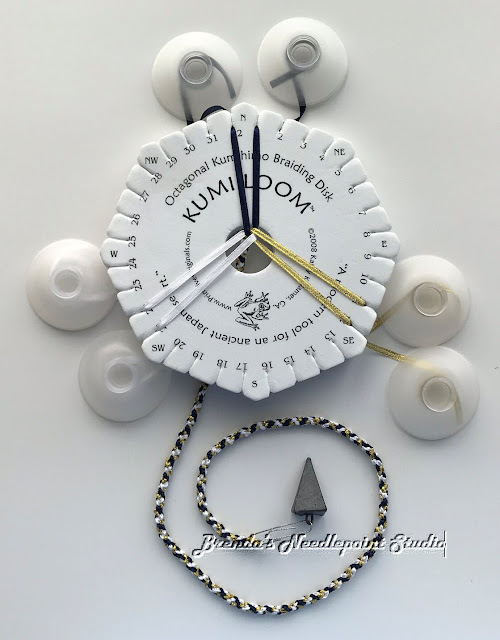 I placed an online order with a bead company for all the types required for this project and am looking forward to placing them onto the ornament. Having never done this type of beading, especially making a beaded tassle, etc., I relish the challenge. Here's my progress to date. This is such a gorgeous ornament, I love it.